From brilliantly unique to uniquely brilliant. With the new EVO version of our flagship MX6 we’ve managed to make a striking machine into a stunning bike. The MX6-EVO is a bike that likes - no, needs - gradients. It’s a proper mountain bike. Built for clambering up stuff and then carving its way back down the other side. If we had to pigeon hole the MX6-EVO into a category then we’d happily say it was an enduro bike through and through. After all, enduro racing is just our normal sort of riding set against a stopwatch. Fast, fun, tight, twisty, demanding, rewarding. All the good stuff. 150mm of utterly capable and reliable travel. Our carefully located pivot point delivers excellent high speed bump performance, constant wheelbase stability and a spot-on rising rate for exceptional feel and response. Full-compliment needle bearings are used in the main pivot as, unlike most other bike bearings out there, they’re designed to take high loads during rotational movement. You won’t be replacing creaky bearings every few months on the MX6-EVO. Geometry is aggressive and modern. Slack, low and long. It rides like a rally car mixed with a motocross bike. The 66.5° head angle is right in the sweet spot. The 350mm BB height and 435mm chain stays combine to make a sure footed but nimble play bike. 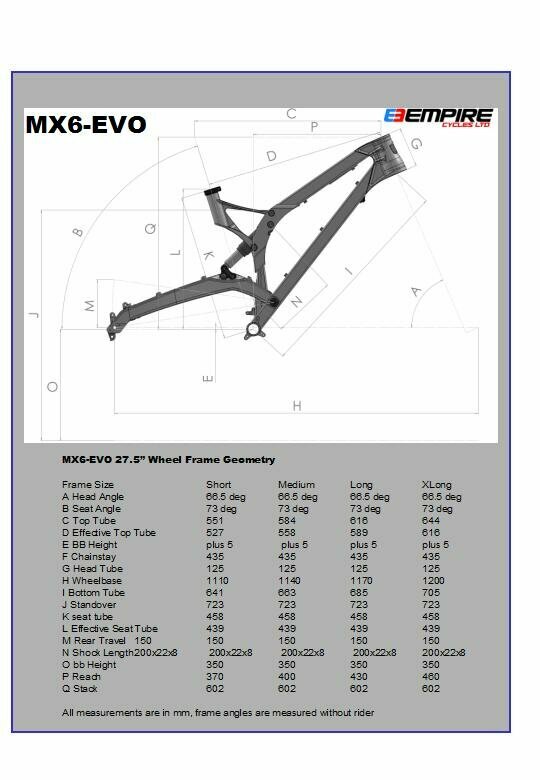 The MX6-EVO can be run as 27.5" (650b) or 26”. Our custom made adaptors for the head tube and the swing arm take into account the differences in each wheel size option. There’s no cut ’n’ shut bodging or fudging here. Properly thought out. Properly executed. Use your existing 26” stuff. Move to 27.5" if you want to later on. No problem. No hassle. On a similar note of adaptability and versatility, the bolt-thru rear dropout can be set as 135mm or 142mm. No need to worry about future hub choice. The bottom bracket has tabs designed to take both ISCG 03 and ISCG 05 standards. No chain device worries there either. We’re mountain bikers just like you. We know what we want in a bike just like you. We know what works. We know what doesn’t. We know what’s important. We know what’s a gimmick.